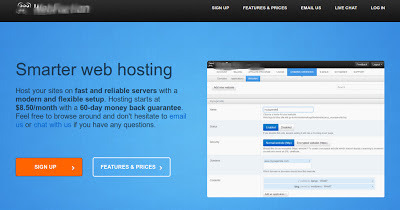 "Smarter Web Hosting"... Why'd you think it's smarter? Translate that into benefits that I can understand. Don't just say FAST, tell me how fast compared to a well-known benchmark. Modern--who cares? Describe the equipment, how does your server work that's different from what I have now? Flexible setup? What does that mean? Why should I (your target audience) care? "Feel free to browse around and don't hesitate to email us or chat with us if you have any questions." What makes you think I will want to browse around? The only reason I found your website is because I clicked on an ad from another website that I wanted to support. Why should I spend more time looking around your website when the message on your landing page failed to hold my attention? Your website is today's version of the sales letter. First, your website has to grab your audience's attention. You can entertain them, shock them, or better yet, give them information that they are looking for. Like any sales letter, you do not know how your audience is reacting to your message. This is why you have to ANTICIPATE every issue, objection and problem that they might have. You can't afford to not do this. Most websites today try to look hip and "web 2.0-ish" that their audience doesn't get the message. This is why most websites fail to convert. Now... this website failed to ask a closing question on their landing page. That's a big no-no for any sales person. You might say that there was a sign up button in bold orange, plus another one for features and prices. That's not enough. Why? The message on the landing page did not get me excited about moving away from my current provider. Why should I click on those conversion buttons. During those first few seconds when your prospects finds your website, give them your best "reason why". Remember, they are either doing business with someone else, or seriously considering signing up with your competition.